Have you had the opportunity to experience the awesomeness of the most scenic airport approaches? 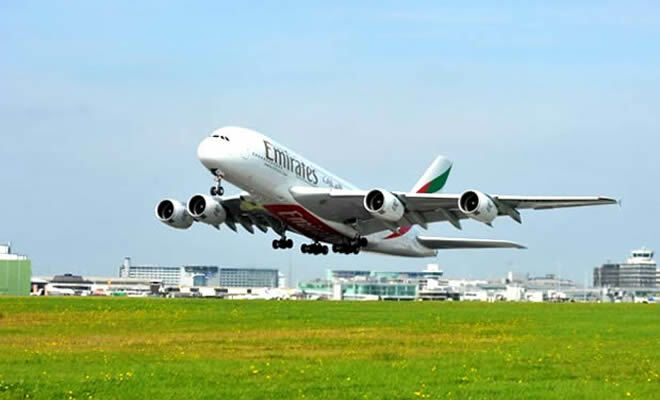 When it comes to travelling by air, not many airports can boast of offering awesome scenery as most of the airports are located in polluted and overcrowded cities. Airports all over the world are in different sizes and capacities. Some of the big cities like London, New York, Paris, Atlanta, Tokyo and others, have big airports to be able to accommodate people flying in and out. Also, most of these big modern cities even have two or more airports to be able to cater for the huge number of travelling passengers. But as big as some of these city airports are, they do not offer most scenic airport approaches and landings. We have put together a list of top 5 world’s most scenic airport approaches and landings below. 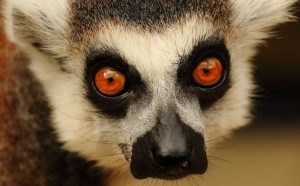 When you are travelling there, be sure to have your camera close to you so that you can take some awesome snaps. Sint Maarten encompasses the southern half of the Caribbean island of Saint Martin with its capital city in Philipsburg. The Island is a top destination for holiday makers especially from Europe and North America. Located in St Maarten, Princess Juliana Airport, which is also known as St Maarten International Airport, offers one of the world’s most scenic airport approaches and landings. 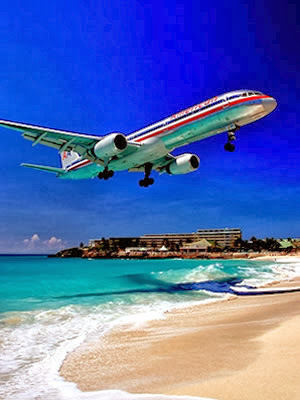 The Princess Juliana airport is exceptionally close to the beach, with low-flying aircraft skimming the heads of holidaymakers below. Saint Maarten encompasses the southern half of the Caribbean island of Saint Martin with its capital city in Philipsburg. Located in the Indian Ocean, Maldives is an island that’s popular amongst the holidaymakers. Over 95% of the island is made up of sea, making it one of the most visited islands by holidaymakers. Surrounded by the Indian Ocean, Malé airport (officially called Ibrahim Nasir International Airport) is situated on Hulhulé island, one of the twenty-six Maldivian atolls closest to the capital island Malé. 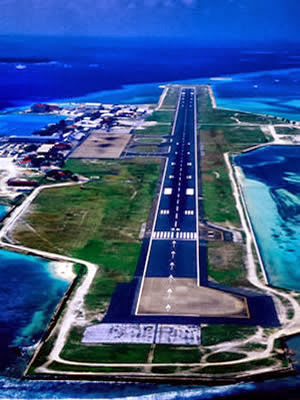 The runway at Male International Airport stretches from one end of the small island to the other. Approaching the airport offers scenic views of the archipelago of the Maldives, making it one of the world’s most spectacular airports at which to arrive. Gibraltar is a self-governing British Overseas Territory located at the southern end of the Iberian Peninsula. 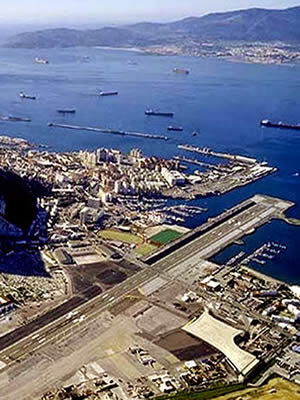 Gibraltar International Airport is the world’s closest to the city that it serves, being just 500 metres from Gibraltar’s city centre. 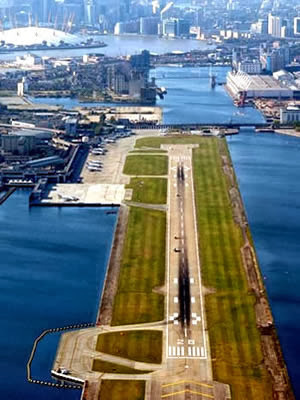 It has a runway that is actually intersected by a main road which closes every time a plane lands or departs. The rock of Gibraltar looms large on the stunning approach, causing unusual wind patterns and turbulence. The History Channel programme Most Extreme Airports ranks Gibraltar Airport as the fifth most dangerous airport in the world and the most dangerous in Europe. 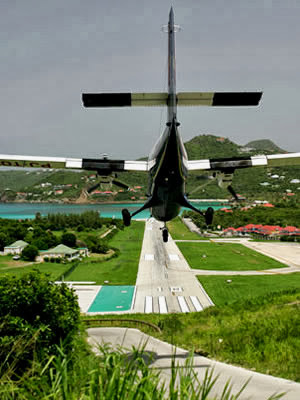 The village of St. Jean where Gustaf III Airport located is on the Caribbean island of Saint Barthélemy. With a runway length of just 650 metres, Gustaf III Airport does not cater for international flights – only scheduled and private charter propeller services. With very tight angles, hills, unusual wind conditions and the short landing strip to negotiate, it is a very challenging descent, with only the most qualified and highly-trained pilots able to land there. The arrival descent is extremely steep over the hilltop traffic circle and departing planes fly right over the heads of sunbathers. The History Channel programme Most Extreme Airports ranks Gustaf III airport, which is casually referred to as “St. Barth’s”, as the 3rd most dangerous airport in the world. London City Airport is the closest airport to London’s city centre. 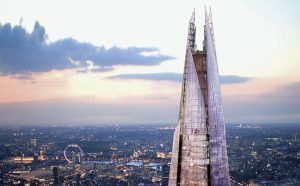 The airport is few miles away from some of the London’s major attractions such as the world-class events venue ExCeL London; 2012 Olympic Games park; Canary Wharf etc. 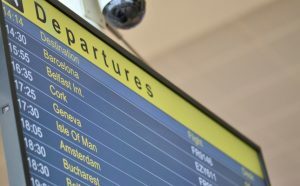 The airport is the UK’s leading business airport serving over 40 destinations across the UK, Europe and the USA, with connections to the rest of the world through the major European hubs. The approach to London City airport provides a scenic approach over landmarks including Big Ben, the London Eye and the 2012 Olympic park.